REVERE Award Winner, PreK-12 Learning Group, Association of American Publishers! At first glance, you can see the value of Science Learning in the Early Years because it provides you with both 40-plus classroom activities and an understanding of how to use them with young students. The book shows you how to go beyond demonstrations to experiences that actually get children engaged. The activities focus on science concepts that are important, clearly presented, and developmentally appropriate; connect to the Next Generation Science Standards; and highlight safety concerns. The book also helps you group individual activities into an ongoing science unit so students can develop science inquiry skills over time. When you start to immerse yourself in Science Learning in the Early Years, you’ll see that the value of this collection goes far beyond activities. The author is teacher, columnist, and blogger Peggy Ashbrook, who has been called a force in promoting high-quality science content for grades preK–2. Reading this book makes you feel like you’re talking with a fellow practitioner—one who’s been where you are and wants to share all the insights she’s gained. Meeting her through her writing is the next best thing to having her as your own personal guide to the challenges and fun of working with the youngest scientists. Science Learning in the Early Years is a complete guide to introducing young children to the excitement of science inquiry and discovery. A mentor teacher, columnist, and blogger, Peggy Ashbrook knows how to engage children, respond to their questions and nurture their curiosity in ways that build skills and confidence. And she knows how to coach teachers! It is so helpful to see Ashbrook’s teaching in action as the describes how a simple activity such as playing with wet sand can be part of a broader inquiry involving science and engineering concepts about the properties of water. She offers guidance for conversations with children from the first open-ended question: Tell me what you are working on here,” to follow-up questions and suggestions, “What else have you tried?” and “Let’s look at the sand using magnifiers to see what is happening to the sand grains when you pile them up.” Science Learning in the Early Years includes a wide range of Ashbrook’s columns spanning a 10-year period for NSTA’s journal, Science & Children. 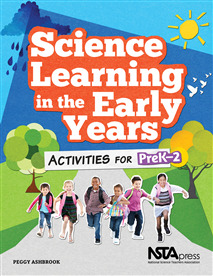 The book updates the material to include related Early Years blog posts, the Next Generation Science Standards, safety information and additional resources. Some of my favorites include making a kazoo, reading stories and making predictions, moving air, making pretend rocks, drawing motion, observing with magnifiers and planting peas. Ashbrook gives guidance on how these activities are “small steps in a journey of science inquiry” as part of an ongoing exploration of a question, a concept or a topic. Experienced teachers as well as those new to the field will find useful suggestions for deepening science experiences. I’m eager to explore melting with my preschool class by using Ashbrook’s ingenious activity in which children compare holding a piece of beeswax in one hand and a chocolate chip in the other. Each step is clearly laid out including the questions to ask: “Did any change happen to the wax or chocolate?” and “Which is softer?” Her reassuring tone, lists of easy-to-find materials and clear directions make the activities doable. The background and theory of science inquiry, overviews of the different overall topics and the standards addressed make this a go-to source for sound curriculum to carry out throughout the school year, rather than just a grab-bag of one-off activities. Activities are not tied to a single curriculum model but can be adapted to support High Scope, Creative Curriculum, Head Start, and other frameworks. Science Learning in the Early Years bring the joy of discovery to life!